The thing that finally set the ball rolling was a significant company merger: in July 2015, Citycon acquired the second largest shopping centre company in Norway, Sektor Gruppen. Their intranet was running on the eZ Publish platform. Along with the merger, Citycon’s number of personnel doubled, and now the company had two overlapping intranet systems with quite dissimilar operating principles. Citycon needed a new, mutual social intranet to support change, encourage getting to know the new co-workers, promote communality, and to create One Citycon culture. – The project team set a clear target: it was obvious that the new intranet should be easy to use and accessible from any device, says IR and Communications Specialist Maiju Röysky, who was in charge of the intranet renewal project at Citycon. – During the preliminary study stage, we outlined that the intranet should be inspiring, dynamic, fresh, visual, and social – just like our business operations! We wanted to encourage people to be social and to share things. We wanted a platform for sharing both best business practises and moments in everyday life in shopping centres, as well as liking and commenting company-internal news. The main emphasis would be on supporting mutual company culture, ensuring that company internal communication and common guidelines would remain the core of the intranet. In future, the role of the intranet could be extended to digital teamwork. North Patrol supported Citycon in surveying the needs of different personnel groups, outlining the intranet concept, and picking the right technology. Cooperation continued by creating the specifications based on the chosen technology, and by request for proposals facilitation. As a result, Citycon had a clear-cut plan, a suitable technology, and a capable partner for the implementation. By way of contemplating the correct technology, the intranet redesign project expanded into a broader change project for digital work. Citycon decided to take the leap into the cloudy world of Microsoft Office 365, which enabled them to transfer their email and calendars into the cloud, making their IT department’s work easier by letting them use Office applications which keep themselves up to date via the cloud service. One of the O365 package’s advantages is the integrated social conversation tool Yammer and the dedicated mobile app. Citycon had expanded fast in the merger, and they were in desperate need of a social digital tool. – We have received the most feedback about Yammer. People truly like it, and they are using it very actively! Maiju Röysky celebrates. – Yammer has brought us a whole new communicative culture. 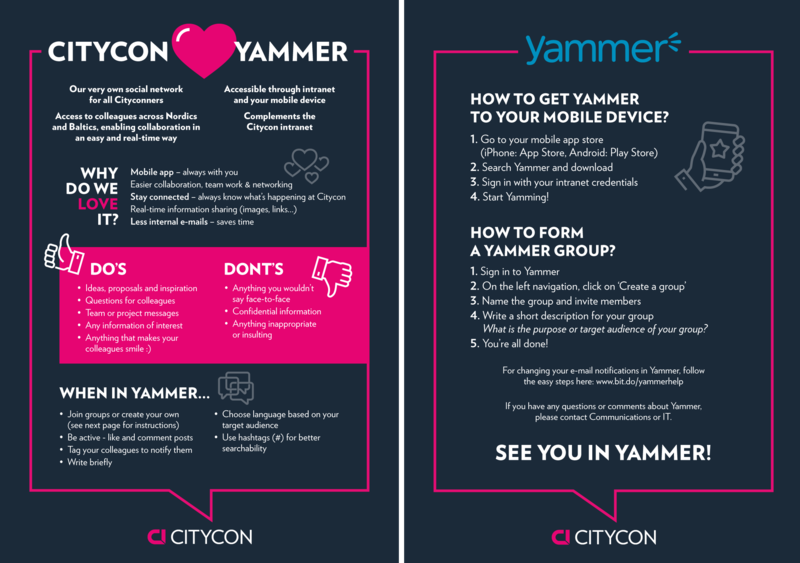 Citycon’s Yammer is now being used for sharing pictures of success and everyday life between teams and countries, as well as campaigns and events in our shopping centres. That means things for which we didn’t have a channel before. Especially the joys and ordinary life in our shopping centres largely stayed within each centre’s own work community. Previously, Citycon’s internal communication mostly focused on one-way, corporate-level information distribution, but now with Yammer, our business has become more visible, and everyone at Citycon can be a part of the constant flow of things happening in our shopping centres. Already at the intranet concept creation stage, a plan for Yammer groups to be created was outlined. – We set up groups in Yammer for each country, office, shopping centre development project (e.g. the Iso Omena and Lippulaiva projects in Finland), as well as shared groups called Shopping Center Inspiration and Coffee Corner, says Maiju Röysky. In addition to these, people have naturally created their own groups based on their own needs. Several posts are shared each day, and in addition to Yammer, they are displayed on the intranet front page as well. 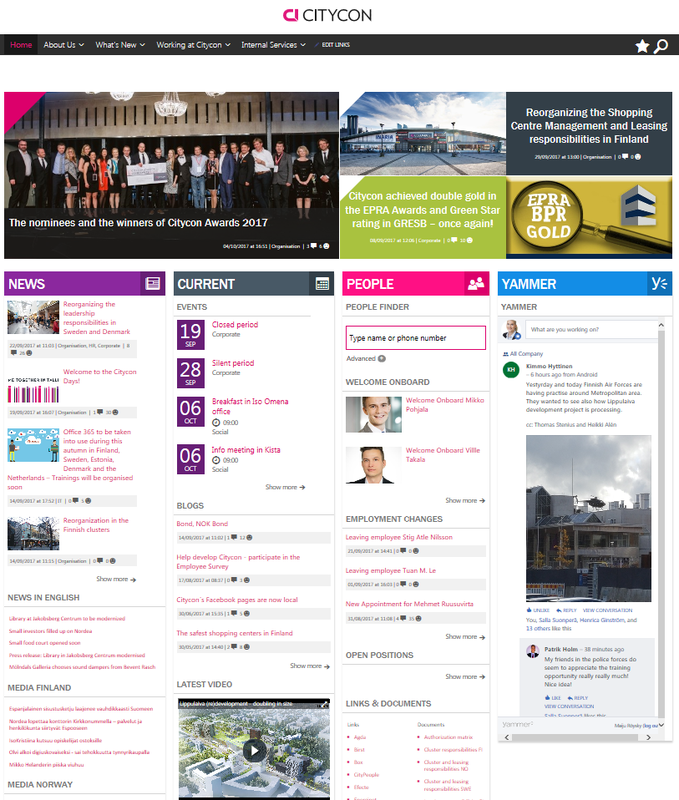 – The intranet and Yammer were launched simultaneously in September 2016 during the annual, company-wide Citycon Days event. The old intranets were taken down right away. No one misses them, really! Maiju Röysky chuckles. The Yammer implementation was supported by an internal campaign which included e.g. an old-fashioned paper leaflet (see below). The document contained concise instructions on where to find Yammer, and how it was intended to be used. Through a request for proposals, demonstrations, and meetings with prospective implementation partners, Citycon chose Blue Meteorite and their Valo intranet product as the platform for the new service. Valo includes ready-made content management solutions for e.g. bulletins, main news, blogs, and event calendars. Most importantly, it is a safe and robust solution with a pleasing visual layout, based on O365’s SharePoint Online. Citycon’s project team was able to focus their attention on updating the content and committing a larger group of well-motivated employees to content creation. – Valo here is a bit like a prefabricated house, whereas Drupal makes you do everything from producing your own tiles. Both have their merits. Well-planned is halfway done. Even if you are keen to cut to the chase right at the start, be advised that it is definitely worth it to spend enough time for the preliminary studies and concept creation. Be patient! Many times intranet projects are actually development projects for the organization’s internal communication culture. And you cannot change culture overnight. People need positive encouragement and “holding their hand” at times. Bring your IT team along for picking the right technology, and you will avoid backend system conflicts. Remember: internal communication does not have to boring!